Looking back, it’s easy to forget that until the early 70s and his wars with Bonavena, Frazier, Norton and Foreman, many seriously questioned the toughness of Muhammad Ali. While now rightfully included on any list of the best chins in boxing history, Ali had yet to prove the soundness of his mandible when he first became heavyweight champion. The simple fact was, few put much stock in his repeated statement, “I am the greatest!” until after his exile and his battles with the biggest and best heavyweights of the 70s. 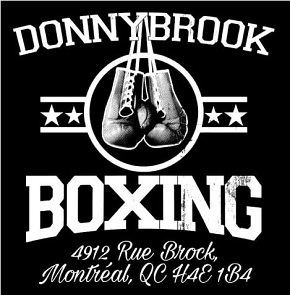 Before that a haze of confusion obscured his two upset wins over Sonny Liston, some regarding the second bout as a blatant, if inept, fix. And in his first defenses, against Floyd Patterson and George Chuvalo, the chin of the man many still called Cassius Clay was not seriously tested. 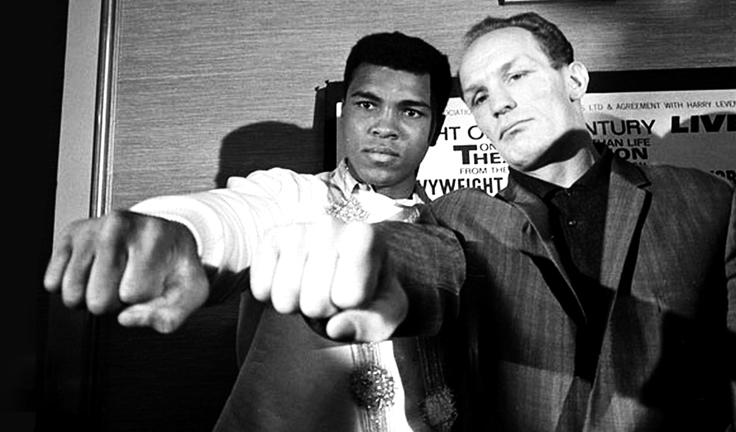 All agreed this most unpopular of heavyweight champions was extraordinarily quick and nimble, but the question, “Could he take it?” brought back memories of June 18, 1963 and the first meeting between contenders Clay and England’s Henry Cooper. Cooper’s lethal left hook put Clay down hard in the first fight. Numerous legends have attached themselves to that bout, most of them complete balderdash, but the truth of the matter is Cooper’s style gave “The Louisville Lip” serious problems. A steady if unspectacular battler, Cooper had a terrific left hand, both jab and hook, and he used it effectively against his bigger and faster opponent. The jab upset Clay’s timing while the hook repeatedly put him on the defensive. In the opening round of that initial clash, Cooper took the fight to the American, mauling and roughing up his bigger opponent and even bloodying Clay’s nose, young Cassius throwing looks at the referee as if to ask, “Is this legal?” At this point Clay was still a novice at battling on the inside while Cooper eagerly accepted any chance to get close and pound the younger man’s body. What was shaping up as a competitive contest was marred as early as the second round by a gash over Cooper’s left eye. “Our ‘Enry” cut easily, his fragile skin a factor in most of his career losses, but the British and Commonwealth champion kept pressing the action while Clay appeared reluctant to go for the finish. No doubt this had to do with the Olympian’s pre-fight prediction of a fifth round stoppage. But his hubris almost cost him the fight when near the end of the fourth a desperate Cooper started winging vicious left hooks. He connected three times over Clay’s low right hand and the third blow, landing scant seconds before round’s end, put the future champion down hard for only the second time in his career. A ghastly cut forced a stoppage in round five. Confusion reigns over what happened next. Boxing lore says Clay was knocked out of the ring and when he just barely beat the count he was virtually out on his feet, saved from toppling again by the round-ending bell and his handlers. Not true. Clay fell awkwardly onto the ropes but never left the ring. He rose quickly, at the count of four, the bell sounding as he did, and then walked immediately to his corner, his legs appearing steady. The legend has it that a severely hurt Cassius was then saved by some quick thinking from trainer Angelo Dundee who intentionally damaged one of Clay’s gloves, the search for new gloves resulting in a lengthy delay during which Clay recovered. Ali and Cooper hype the rematch. But, as is often the case, the facts don’t get in the way of a compelling story. While Clay went on to stop Cooper in round five thanks to a nasty gash over the Britisher’s left eye, the tale still persists to this day of how ring officials had to go back to the dressing rooms to find replacement gloves during the interval and that Dundee saved Clay from an upset KO loss. Admittedly, Dundee did buy Clay some extra time to recover from “Enry’s ‘Ammer,” though his charge showed no sign of needing it. 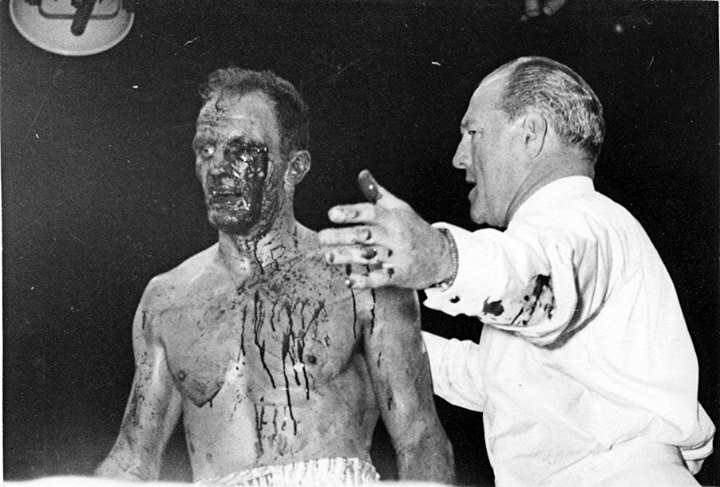 But a tantalizing “What if?” question soon arose for those who wanted to believe Henry Cooper had been one punch away from scoring a massive upset. 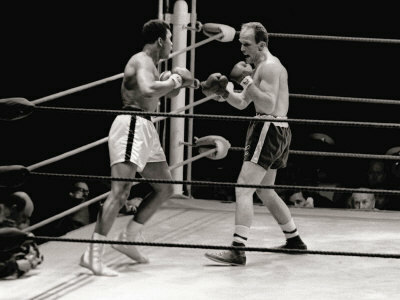 Thus the controversy of the first Ali vs Cooper meeting fueled intense interest in the rematch three years later. Cooper had supposedly come so close to knocking out the current heavyweight king, now known as Muhammad Ali, that British fans could hardly contain their excitement about a return bout, again in London, and this time for the heavyweight championship of the world. And the fact is this contest has also become obscured by time. 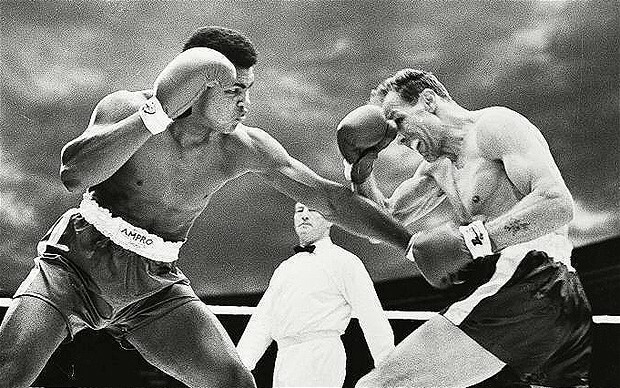 What few recall is how Cooper, a journeyman with eleven losses on his record, gave Ali a most difficult ordeal until once again his brittle skin betrayed him. 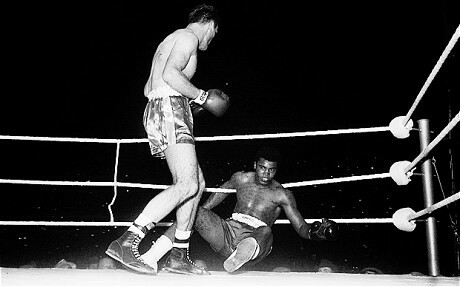 The opening round belonged to Ali who glided about the ring, snapping a long left lead, but round two saw Cooper begin to press in earnest, cornering the champion on more than one occasion, landing a right early and a hard left hook late, and in the interim establishing his own effective jab. If the second was close, the third clearly belonged to the challenger as he continually forced Ali to back up or clinch. 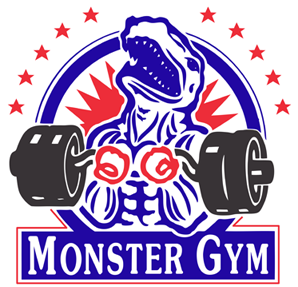 A pair of hooks got through and seconds later an aggressive Cooper landed a hard left-right before forcing the champion to the ropes, where he connected with two heavy lefts to the body followed by a rabbit punch. Ali responded to the foul by grabbing Cooper’s head and yanking him down and forward, a move that brought boos from the crowd and a stern warning from the referee. When the action resumed it was Cooper, not Ali, landing the jab. The champion picked up the pace before the end of the round, bouncing a hard right off Cooper’s head, but it was without question the challenger’s round. 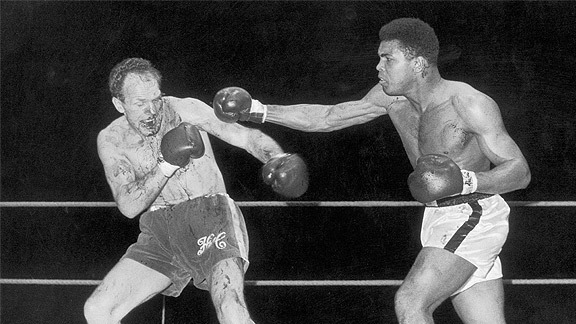 Cooper’s style and heavy left hand gave Ali serious trouble. The pattern continued in the fourth. Cooper again succeeded in cutting off the ring, initiating some nasty business on the inside and in the clinches, getting his forearm into Ali’s face and landing a few kidney punches. 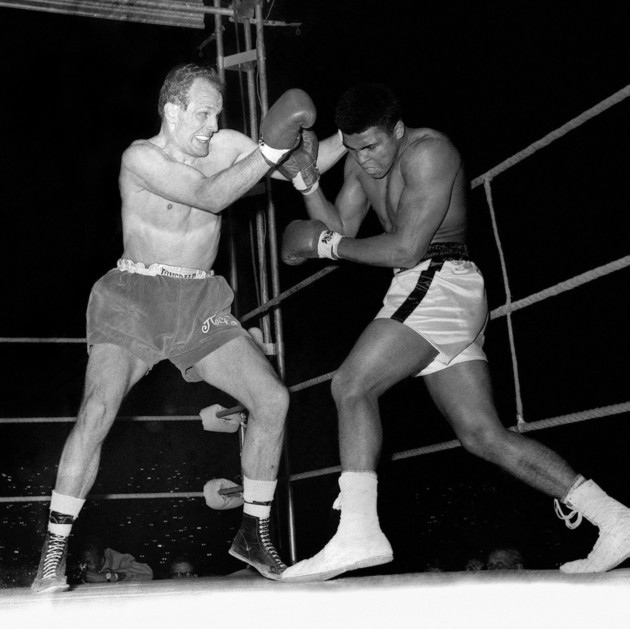 At this point Cooper appeared stronger than Ali, who was clearly bothered by the Englishman’s tactics and openly complained to the referee before Cooper landed another tidy one-two, the left to the body followed by the right to the head. Gathering himself, Ali finally began to exploit his reach advantage, throwing the jab with conviction and following up with right hands. Near the end of the round Ali connected with two sharp rights while effectively parrying Cooper’s hook. The fifth saw Ali dancing but with Cooper again out-jabbing him, though the Englishman was openly frustrated by his inability to get the champion to stand still for a second. On the inside Cooper was boss, landing a pair of solid body punches and then forcing Ali back with a right hand. For the remainder of the round the boxers exchanged jabs, neither man having a decided edge. Then came the unsatisfying conclusion. Early in round six the gutsy Britisher bull-rushed Ali into a corner and paid for his aggressiveness by getting caught with a quick right hand which sliced open his left eye brow. The injury was visible to all, the blood flowing freely down the side of the challenger’s face. Aware the fight could be stopped at any moment, Cooper stormed after Ali, chasing him about the ring as the huge crowd roared. But once again a bad cut and the ensuing onslaught decided the contest. 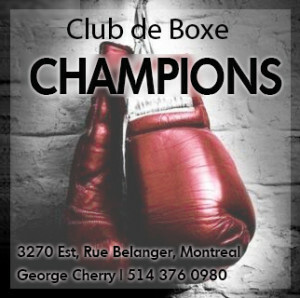 The champion responded by finally opening up, landing a series of right hands and seizing full control of the action. 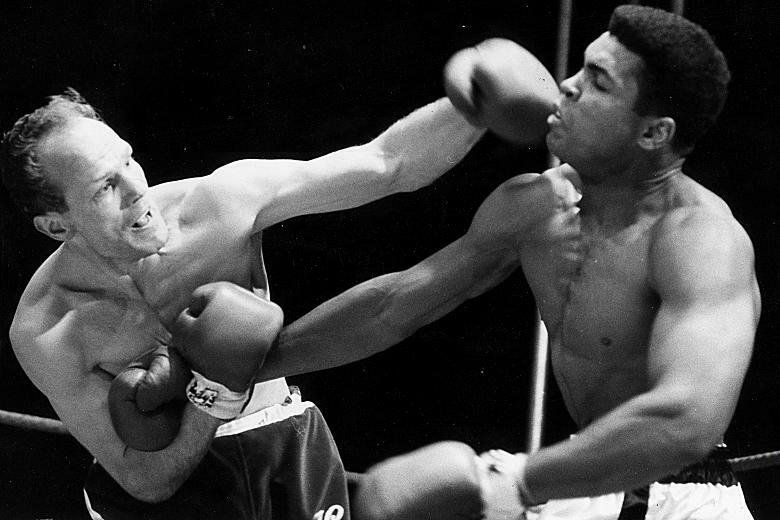 The challenger never stopped winging shots but Ali’s blows were the ones landing cleanly. A hard one-two forced Cooper to clinch and the referee seized the opportunity to take a closer look at Henry’s injured eye and then halt the contest. There was no choice; Cooper’s face was bathed in blood. Boxing writers have never been particularly kind to Cooper, and his performances against the more athletically gifted Ali have never been recognized for their courage and technical effectiveness. But Ali himself acknowledged them. Following their second bout he told the press he had never faced a braver man, nor a more difficult opponent.